The Champion Power Equipment 100111 Portable Generator is designed with your safety and convenience in mind. Owning this rugged 12,000 Watt generator means the next time theres an outage, the power in your house stays on. For projects, the massive 717cc V-Twin Champion OHV engine has what it takes to handle the multiple power tools and large equipment you need to get the job done. The Intelligauge monitors voltage, frequency and operating hours. At 15,000 starting Watt and 12,000 running Watt, this powerful unit can handle it all in an outage � lights, sump pump, refrigerator, security system, window AC, furnace blower, fan, TV/DVD, computer, well pump, microwave and will start and run a central AC with a manual transfer switch (not included). Volt Guard built-in surge protector prevents overloads and keeps your equipment safe from spikes in voltage. All the outlets have covers for protection and include 120V 30A (L5-30R) and 120/240V 30A (L14-30R) locking outlets, a 120/240V 50A outlet (14-50R) and four 120V 20A GFCI protected household outlets (5-20R). Fill up the 10.9 Gal. tank of gasoline, and enjoy up to 9 hours of power at 50% load. From 23 ft., the noise level is 78 dBA, similar to what youd hear on a busy street. This unit has a low oil shut-off sensor and includes 1.5 quarts of 10W-30 engine oil. Champion Support and our nationwide network of service centers will back your purchase up with a 3-year limited warranty and free lifetime technical support. 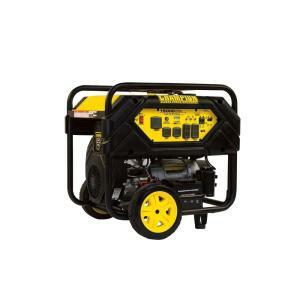 Ultra-Powerful – At 15,000 starting Watt and 12,000 running Watt, enjoy up to 9 hours of run time on a full tank of gasoline with a noise level of 78 dBA from 23 ft.
Tbook.com crawls the web to find the best prices and availability on Generators and related Tools and Hardware products like Champion Power Equipment 12,000-Watt Gasoline Powered Electric Start Portable Generator. For this page, related items include products we find that match the following keywords: "Generator GENERATOR" at our vendor partner Home Depot. Champion Power Equipment 12,000-Watt Gasoline Powered Electric Start Portable Generator is one of 152 Generators and related products listed in the Tools and Hardware section of Tbook.com If you have any questions on this product, please give us a call at 734-971-1210 during the hours of 9am - 5pm EST for assistance. Thank you for shopping at Tbook.com, the Internet Department Store!